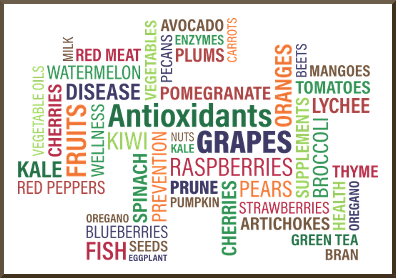 antioxidants – Do we need them? We all need various antioxidants to fight any imbalance of free radicals that may exist in our bodies and which can cause any number of different ailments, but don’t believe they are a magic bullet, the answer to all our ailments and health problems. Taking too much of a combination of antioxidants, or even a single antioxidant all at once can lead to problems, as can too little. antioxidants – how much do we need? Despite what advertisers and manufacturers of dietary supplements may tell you, that a lot is great, antioxidants are micronutrients and only needed in small doses. Although our bodies need many different vitamins to stay healthy, there are four major antioxidant vitamins: vitamins C E A, and beta-carotene, a form of vitamin A, that we need. It is unlikely you can overdose by getting your vitamins and minerals from food, but supplements can be another matter, which we’ll deal with later in this article. Let’s look at the vitamins in the order they appear. The recommended dose for daily vitamin C intake is 90mg (1,800 IU) for men aged 18+ and 75mg (1,500 IU) for women aged 18+. Since vitamin C is water-soluble it is hard to overdose as the body will use what is required and excrete the surplus through urination. Unlike vitamin C, vitamin E, consisting of eight different compounds found in food, is fat-soluble and any excess is stored in the body. The recommended daily intake of vitamin E aged 14+ is 15mg (22.4 IU). Obtaining enough vitamin E from food shouldn’t present a problem, and is neither risky or harmful. However, supplements containing high doses of vitamin E may reduce the blood’s clotting ability after injury, possibly resulting in hemorrhagic stroke (bleeding in the brain). This reduced ability of the blood to clot can also increase the risk of bleeding in people taking anticoagulant or anti-platelet medicines, such as warfarin. To reduce this risk it is recommended that the maximum daily amount from supplements containing natural forms of vitamin E is 1,000mg (1,500 IU) and from supplements containing synthetic forms if vitamin E is 1,001mg (1,100 IU). Another fat-soluble vitamin obtained from animal products. Any excess of vitamin A is stored in the liver, and it accumulates over time and can cause many different health problems. The recommended daily allowance (including any supplements being taken) is 900mcg (3,000 IU) for men aged 14+ and 700mcg (2,310 IU) for women aged 14+. Ideally, all vitamin A should be obtained from food, as it it not advisable to take vitamin A supplements unless recommended by a medical practitioner to counteract vitamin A deficiency. Although it is wise to stick to the recommended daily allowance (RDA), there is a Tolerable Upper Intake Level (UL) of Retinol: 14-18 years: 2,800mcg (9,240 IU), 19 years+: 3,000mcg (10,000 IU), which most people can safely take. The tolerable upper intake level should not be exceeded, amounts higher than this, taken over a period of time, can lead to vitamin A toxicity, often referred to as Hypervitaminosis A. Symptoms or side effects of vitamin A toxicity can vary according to its severity, acute or chronic. Headaches and rashes are evident in both stages of toxicity. Increased pressure on the brain due to Cerebral Edema. The worst scenario is Coma and, eventually, Death. Kidney Damage caused through too high levels of Calcium. A red-orange pigment found in plants and fruits, especially carrots and colorful vegetables, that converts to vitamin A (Retinol) during digestion. Dietary beta-carotene is considered a safe form of obtaining vitamin A as no upper safe limit has been set and your body will only convert into vitamin A what it requires. Bleeding or Bruising not associated with injury. A more serious side effect is the increased chance of developing lung cancer among heavy smokers who consume more than 20mg (25,005 IU) daily over a long period of time. Several decades of dietary research findings suggested that consuming greater amounts of antioxidant-rich foods might help to protect against diseases. Because of these results, there has been a lot of research on antioxidant supplements. Rigorous trials of antioxidant supplements in large numbers of people have not found that high doses of antioxidant supplements prevent disease. But are the claims for these over-priced and over-hyped supplements justified, and how were the figures arrived at? And, more importantly, can we believe them? As most nutritionists and dieticians will tell you, a healthy diet consisting of a wide variety of foods should provide all the antioxidants, vitamins and minerals you need to stay healthy unless supplements are needed for an underlying medical condition, and then only under medical supervision. ORAC (Oxygen Radiance Absorption Capacity,) was a test devised by the NIH and USDA in 2007 and designed to measure the collective antioxidant power of various substances found in a food and how powerful they were in neutralizing free radicals. Originally, 277 foods tested by the USDA using ORAC that ranked consistently high in antioxidants included common foods such as blueberries, prunes, raisins, kale and beans, with blueberries the highest with a rating of 2,400. Is it any wonder the USDA withdrew the ORAC when figures double, triple, and even quadruple, were being quoted by manufacturers and marketers of health products? How then, were so many different figures arrived at for the same antioxidant food? The standard for testing the ORAC of food is μ mol TE/100g. For example, the latest ORAC test I can find for 100g of raw cranberries shows an antioxidant value of 9090μ mol TE/100g. See High Antioxidant Foods. Depending on how much of a particular food is tested, the density of the food, and whether it was fresh, frozen, powdered or juiced, any figure you like can be arrived at. So, how can claims that acai berry and goji berry are the highest antioxidant foods available be believed when, on the latst ORAC list I could find, acai came in at #24 with a score of 102700μ mol TE/100g, and goji berry at #163 with a score of 3290μ mol TE/100g? We know that 100g of raw cranberries shows an ORAC value of 9090μ mol TE/100g, but 100% pure cranberry juice has an ORAC value of only 1452μ mol TE/100g. Raw blueberries have an ORAC value of 9019μ mol TE/100g while 100% pure blueberry juice has an ORAC value of only 2359μ mol TE/100g. This is due mainly to much of the antioxidants being left behind in the skin and flesh after processing. Apart from the lower ORAC value of juices they’re also higher in sugar than the actual fruit. 100 grams (3.5oz) of unsweetened pure cranberry juice has a sugar content of 12.10 grams, the raw fruit has only 4.27 grams per 100g. The sugar content of blueberries is 16.01 and 9.66 respectively. As most commercially produced fruit juices are a blend of a number of different fruits, some of them from concentrate, and many with added sweeteners or sugar, due diligence is needed. In 2012, the USDA removed the ORAC test from its website for two reasons: That the figures were being blatantly misused, and there was no proven evidence to support those figures as to their benefits on human health. There has been so much hype about the benefits of high antioxidant value foods put out by health food manufacturers and marketers that many consumers are being misled into believing these highly inflated and unsubstantiated antioxidant figures for many foods contain all the essential nutrients they need, unaware that the μ mol TE/100g many of these so-called superfoods are lacking in certain essential nutrients. While I am no position, medically or scientifically, to challenge or dispute the second reason, I can see the reasoning behind it. The ORAC was initially created to test how powerful various groups of antioxidants found in food were in neutralizing free radicals and slowing down the aging process, but it is disputed by many that claims to certain health benefits provided by high antioxidant food remain unproven, so much so the FDA has sent warnings to a number of companies for making misleading and illegal claims about the health benefits of antioxidants in its products. As it is not possible to test the effect antioxidants have on neutralizing free radicals in vivo (inside the human body), all ORAC tests are done in test tubes. This has led to speculation that what may appear to be powerful antioxidants in dealing with free radicals under laboratory conditions may have little or no benefits when entering the human body. Little is known how the antioxidants in food react during and after digestion and metabolization, although it has been established that consumption of high ORAC rated foods can raise the antioxidant levels in a person’s blood, whether this imparts any benefits as far as health is concerned remains unproven. As always, the content of this article is for information only and not meant to recommend or advise. If you have any concerns about diet, supplements, exercise, health; appropriate professional advice should be sought. I hope you have found this article informative. In the following article we’ll look at some common foods high in antioxidants.